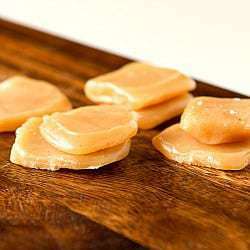 I fell in love with making homemade caramels last fall when I found and re-created the Ale and Pretzel Soft Caramels. Those babies are incredibly addicting! 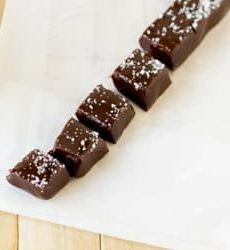 I’m not sure how I stumbled upon Shawna’s recipe for these sea salt caramels recently, but I’m so glad that I found them. These are caramels laced with a hefty dose of fleur de sel (or sea salt) and speckled with gorgeous vanilla beans. 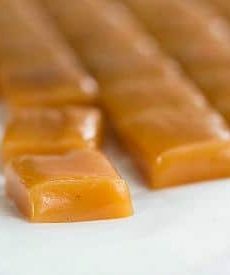 Caramel has been an acquired taste for me and over the last year or so I have completely fallen in love with the flavor since making candies and sauces at home. I plan on making multiple batches of these once the holidays roll around. Some for munching, and taking a page from Shawna’s book, some for dipping in chocolate! 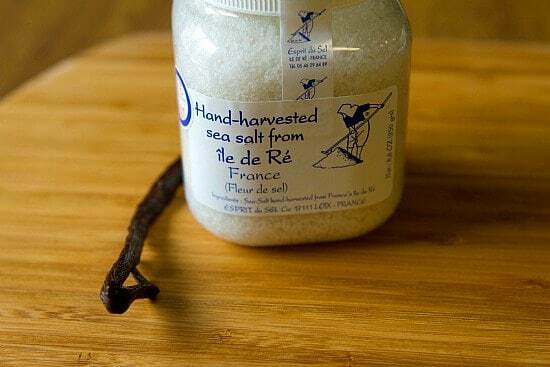 I buy my fleur de sel (fancy sea salt) at Williams Sonoma. I had been using regular sea salt for a long time, but I can tell you that there is definitely a difference – the fleur de sel is light and flaky. It transforms recipes. Totally magical. 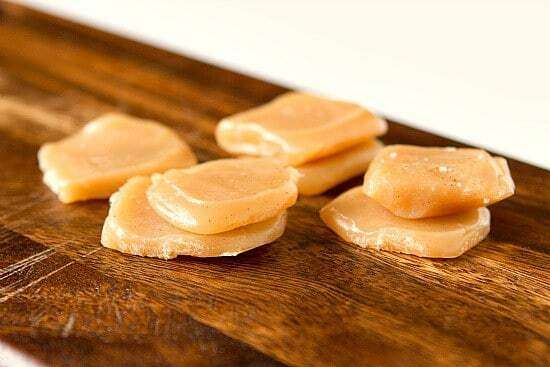 Now, full disclosure – my caramels are a little light and a little flat for two reasons. First, I think I needed to let the mixture go a little longer to the “light caramel color”. I tend to be a bit light-handed when it comes to caramel because it can go from gorgeous to burnt in an instant. But in this situation, it likely needed another couple of minutes to really get the job done. Secondly, and I forgot this from my time spent with caramels last year – if the caramels are a tad soft, you need to wrap them up right after you cut them. Otherwise, they will go sort of flat on you. Case in point above. All that being said, these are PHENOMENAL. Sweet, salty, caramel, vanilla. They really are incredible. And I highly recommend checking out Shawna’s photos – you will see what these gorgeous candies should truly look like! And bonus – keep an eye out tomorrow because we’ll be using these candies for another awesome recipe. I couldn’t get enough of the salted caramel goodness! 1. Line bottom and sides of an 8-inch square baking pan with parchment paper, then lightly butter parchment. 2. Bring cream, butter, vanilla, vanilla beans, the vanilla pod, and sea salt to a boil in a small saucepan, then remove from heat and set aside. 3. Boil the sugar, corn syrup, and water in a 3- to 4-quart heavy saucepan over medium heat, stirring until sugar is dissolved. Boil, without stirring but gently swirling pan, until mixture is a light golden caramel. 4. Remove the vanilla pod and carefully stir cream mixture into the caramel (mixture will bubble up) and simmer, stirring frequently, until caramel registers 248 on thermometer. Pour immediately into the prepared baking pan and cool 30 minutes. Sprinkle another pinch or two of salt over the top of the caramel and let sit until completely cooled. Cut into 1-inch pieces (a pizza cutter is perfect for this), and then wrap each piece in a 4-inch square of wax paper, twisting 2 ends to close. I saw a pbs episode of Victory Garden covering Omaha, Nebraska. End of show is the same caramel recipe and she got it from her Grandmother. No vanilla bean but extract. Salt amt was I believe less & general sea salt. She said they sold better than her veggies & food from her farm at the Farmers market. She’s been making them ever since. Thanks for all the caramel recipes. I like caramel more than chocolate, but I favor white chocolate over milk and dark. Hi Della, Most grocery stores sell vanilla beans, and you can always order them online from places like Amazon, Penzeys or Beanilla. If you are going to substitute vanilla extract, 1 vanilla bean = 2.5 teaspoons of extract. The extract should be stirred in at the very end, however. I made these and sent them to work with my husband and they were a huge hit!! I made one small change, instead of using a vanilla bean I used vanilla bean paste and it still came out beautiful and delicious!! These looked so good I had to try making them. I followed recipe almost exactly: I omitted the sea salt on top because I did not have good quality sea salt. Mine turned out darker than yours but they are delicious. This was my first ever attempt at making caramels. Thank you for posting the recipe. I wish I knew how to insert a picture so you could see them. Hm… I tried this and after a few hours in the fridge it’s still very liquid… what went wrong? Thank you! Hi Clemens, The only thing I could think of is to make sure you cooked it long enough – ensure it comes to a light golden color first, and then make sure your thermometer is properly calibrated and that it reached 248 degrees. I just made these the other night and, while they taste absolutely amazing, I had a terrible time getting them unstuck from the wax paper. I used wax paper because I didn’t have any parchment paper on hand. Was this my mistake or is there another trick I should know for getting them not to stick? This was my first time making caramels, so despite this setback I was very impressed with how they turned out! Your recipe reads very well with easy to follow instructions! Hi Elisemarie, Wax paper can definitely “fuse” to hot items, which is why you had trouble with it sticking. If you use parchment paper next time, you shouldn’t have any problem at all. 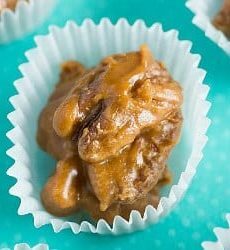 This is the BEST caramels recipe I have ever tried. EXCELLENT!!! Definitely a keeper. If I want to make these, but don’t have any vanilla beans around, can I still follow the entire recipe and just leave out the vanilla bean?? Hi Emily, Absolutely! Just add another teaspoon or so of vanilla extract to the recipe to bump up the flavor. Enjoy! I included these in my Christmas goodie bags this year and got rave reviews. Quite a few people told me it was their favorite thing in the bag! Thanks for the post! Have you tried dipping them in some chocolate? I was wondering if you think it would be good. These look delicious and I can’t wait to try making them! Hi Heather, I think it would be FABULOUS!! I’m wondering how long caramels will stay good? Hi Lindsay, At least a couple of weeks. These look devine. I ordered a gigantic packaged of vanilla beans online and having been trying to think of another way that I could use them. Will try them this weekend. Thanks so much for the recipe. I love anything salty and sweet. These look amazing. I don’t have a lot of luck making caramel but I will give this a try one of these days. Beautiful! I want to put these on my christmas cookie platter!